Nikon just announced the D3300 which will be replacing the D3200. As you know I tend to be a little to critical when it comes to entry level gear but this time I took a step back. It is very important that I look at this gear as exactly what it’s for and who it’s for. It is a very basic entry level camera for someone someone who has an interest in photography and is picking up their first camera. Let’s take a look at the important specs in this camera. First it has a 24.2 megapixel sensor with no OLPF. I can not confirm if this is the same sensor that is currently in the Nikon D7100 but if it is it’s going to be fantastic. OLPF stands for Optical Low Pass Filter. Without having the OLPF you can expect to get sharper more vibrant images. This camera now sports an Expeed 4 processor which will help with processing images quicker and giving you better quality low light shooting. If you would like to read more on the processor please see the press release below. The ISO range is huge going from 100-12,800 expandable to 25,600 though no one should really ever shoot that high. No one can ever say they don’t have enough ISO to capture the image anymore. Having the ability to crank the ISO to 4000 or higher and still come away with great results used to be only possibly in the most expensive of full frame cameras. Now in an entry level camera you have the power to capture images in so many more lighting situations. I also want to take a step back and let anyone know who is new to DSLR photography that your lens aka glass is so important. Better glass will allow more light into the camera which allows you to drop your ISO thus saving on quality. Sure the kit lenses can do the job but the higher you push your ISO the more issues you will see with your image. There are now 11 focusing points which should certainly help you get tack sharp images for stills. The camera will shoot at 5 frames per second allowing you to capture quick bursts of action. I am not sure how many continuous RAW files you may be able to capture but having this option is a plus. Moving on to the video features I forgot to mention in the video that there is a microphone input which allows you to use external microphones like the ones offered by RODE. But the main video feature that this camera added is that it will shoot video at 60 frames a second at 1080. This means you have the ability to capture more frames during video allowing you to showcase slow motion images. There is one thing Nikon mentioned that I found interesting. They mention in the press release that this camera has an optical viewfinder which may seem like common knowledge to people in the know. But to a beginner just getting into the game they may never have thought to do anything other than use live view. 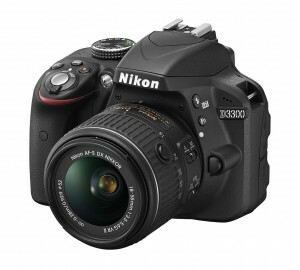 The D3300 will come as a kit with the just announced Nikon 18-55VR II lens for $649.95. This new kit lens is smaller and lighter than before and let’s hope sharper. Let me emphasize that a kit lens is not a bad place to start. You will be able to capture general types of images with fairly good results. Just remember as you grow as a photographer lenses become more and more important. Jared Polin: Right before we jump into this video, I want to let you know that you haven’t signed up for the Froknowsphoto e-mail list; you can do so over on froknowsphoto.com. Just click on this orange box. Put your name, e-mail address in it and hit send it, and we’ll send you a free guide to capturing motion in low light situations. Jared Polin froknowsphoto.com and Nikon just announced the D3300 which replaces the D3200 obviously, and they keep coming out with new entry level cameras. But let’s take a look at what’s inside and makes it different than the D3200. Well the Nikon D3300 has a new 24.2 megapixel CMOS sensor. This has no OLPF so that means it has no low pass filter. Now that’s going to give you sharper, and I think more clarity in your images or sharper images similar to what the Nikon D7100 has. Now I don’t know if it’s the same sensor. I asked all the reps in Nikon they couldn’t give me clarification whether it is the same sensor or not, but if I had to guess I would say yes, which would mean that that’s a pretty fantastic sensor to have in a entry level camera. Now that’s something that I have to keep in mind that I don’t want to be cynical about some of the things that are in this camera because it is an entry level camera. It’s the first introduction for many people in the DSLR cameras. That – it’s a thing right people are going from cell phones and realizing hey, I can get cool pictures with my cell phone, but I want to take it to another level. Will this is the entry-level and let’s see what else it has? So being that it has no OLPF that Nikon D7100 the quality and clarity of images coming out of that are fantastic. And what’s going to help the D3300 is the Expeed 4 processor. There’s a lot of processing that goes on with images and we’re not just talking about compressing the raw files to JPEGs. We’re talking about just image processing. What it’s doing with the data? How quick it can process it in the camera to get it to the card or how quickly it can just make it look good? Well, I kind of sucked at that one. But anyway, it has the Expeed 4 processor. We don’t know if it’s the same sensor as the D7100. But the ISO range is 100 to 12,800 and it has an H1 mode as well. So nobody could ever complain that their camera does not go to X ISO anymore. As cameras have gotten better, the ISO ranges have expanded and the quality has stayed better. One statement that Nikon also made with the 24 megapixels it goes; it allows people the ability to crop without losing much quality. Now, you know that I’m not a cropper. I personally don’t like cropping my images now that is a personal preference. That doesn’t mean that you have to follow that or that has to be something that you have to do. Again with photography it’s whatever you want to do that works. The reason that I don’t crop is that I want to have all of that quality and all of the detail with losing any of it. And as you crop you start to lose some of that quality, and some of that detail. Even if it’s slight and you end up blowing something upto 40 by 60 with a big aspirin [Phonetic] [0:03:16], you may start to see the difference between a cropped image and a not cropped image. Now, for most people it’s not a big deal. You use cropping as a tool to learn how to get better composition in the forefront and why am I moving my hands so much today? I don’t know. Okay, moving on let’s see, it does five frames as – I’m moving my hands. Five frames a second, which is a ton. You got to remember that most of these cameras did two, three frames at the most, but five frames a second is a tremendous step up and it has eleven autofocus points. Think back to the D was like the D40 had three focusing point. Now we have a 11 autofocusing points. My F5 doesn’t have that which is a film camera was top-of-the-line. What did my D2H have? Did my D2H have 11? I don’t, I don’t actually remember but that was a pro camera in 2003. That’s 10 years ago. The quality that you’re going to get out of this camera is going to be far superior than those it maybe even in the D2X. This may outperform that. And its funny even the D3s which were fantastic pro-cameras are starting to be outperformed by some of these, of course, the build quality isn’t as good. But what about video it does 1080P at 60 frames a second. That’s the first, I believe lower end camera that or the first Nikon camera that lets you do that at full 1080. Before you could do it at 720 so as we go forward in the year I’m going to be talking more about video creating video, but 60 frames a second is going to allow you to slow down to get then basically if you’re going to shoot somebody golfing right so they’re golfing. They’re swinging the club. You want to slow that down. The more frames you have the cleaner it’s going to be as you slow that down to do slow motion in the computer. It still has full-time AF whether that’s really good or not, not too sure. Nikon’s haven’t been the best with the full-time autofocus, but that’s it. It’s not – its still not replacing a camcorder. Price? 649.95 comes in black, gray and red. It has a lot of filters, built-in yippy-skippy, but I wanted to remain not cynical and just say that again entry-level cameras are meant to let people learn and then move up from there. One other thing that they said in the press release which, which was interesting was, and it comes equipped with an optical viewfinder. Now, for most of us who are used to shooting with digital SLRs we know that all the cameras have optical viewfinders, but people coming in from the bridge cameras, which I hate that term bridge camera I’ll call them pointing shoots, or iPhones never have used the viewfinder. So to use that as a marketing ploy or not a ploy, but a marketing point is interesting. I could have sat there and been like well who doesn’t know this? But I’m starting to grow and not be as cynical and say wow letting people know the importance of it, so educating people on why certain things are with the camera is smarter than just ripping on them and saying well, you didn’t know that, so that’s a good thing that have and it also comes as a kit with the new 18 to 55 Version 2 VR and that is 33% smaller and 25% lighter. Okay, whatever make it sharper? It’s not a bad lens to start with. For somebody just starting out in digital SLR photography – so somebody starting out in photography who is looking to do stills and video you cannot go wrong at 649 to get this kit. You’re going to get great stills in low light situations even with the kit lens and you’re going to get high-speed shooting five frames a second and you’re getting quality HD video, so it’s a great starting point for anybody jumping off. Remember this if you’re looking to pick up his camera it get – it’s about the – it’s about glass. The better the glass the better quality images you have a chance of getting. So invest in glass as you move forward, but start with the kit. It’s an okay place to start. Learn the basics. Learn the fundamentals. Pickup my froknowsphoto beginner guide to getting out of auto, which is a great thing to check out. You can do that on the screen at any point. Check it out. It’s going to be good, but that is a preview of the Nikon 3300. That’s right. It’s been renamed the 3300. So there you have it guys, 649 not bad at all. Allen’s camera will have them in stock when they come out. They have all of your Nikon needs. Check out allenscamera.com, and there you guys have it. Jared Polin froknowsphoto.com, see you. If you’re looking to get out of auto and learn your new camera well, check out the froknowsphoto beginner guide to getting out of auto. You could click on the screen right now to see a preview of what you will learn in that guide it’s definitely going to help me out, so please go ahead, click over there and check it out. MELVILLE, NY (January 6, 2014) – Today, Nikon announced the Nikon D3300 HD-SLR for those ready to take their photography to the next level. Complete with a 24.2-megapixel DX-format CMOS sensor1 and EXPEED 4 image processor, the D3300 is capable of capturing stunning images and Full HD video with ease. Also featuring an enhanced Guide Mode for those discovering the joy of photography, optional Wi-Fi® connectivity, in-camera effects that operate in real-time and kitted with the new compact AF-S DX NIKKOR 18-55mm f/3.5-5.6G VR II lens, the Nikon D3300 is ready to help capture and preserve every precious memory. For FX-format photographers, Nikon has also announced an addition to its lineup of f/1.8 prime lenses, the AF-S NIKKOR 35mm f/1.8G. At the popular and versatile 35mm focal length, the new 35mm f/1.8 provides stellar image quality and low-light performance whether shooting landscapes, portraits or travel photos. Brimming with fun features, the Nikon D3300 is ready to help create and share incredible stories through beautiful images and HD video. With the help of the optional WU-1a Wireless Mobile Adapter2, users can take advantage of Wi-Fi connectivity for instant uploading of images and videos to a smart device for easy sharing through social networks. Users can also remotely control the D3300 using their smart device as a remote “Live View” monitor. Releasing the shutter from a smart device will help make sure no one is left out of the next family photo. To complement the Nikon small stature of the D3300, Nikon has also introduced the new, more compact AF-S DX NIKKOR 18-55mm f/3.5-5.6G VR II standard zoom lens that inherits a familiar focal length (27-82.5mm, 35mm equivalent) while incorporating a new retractable lens barrel design found in Nikon’s 1 NIKKOR lens series. This design ensures the lens is remarkably smaller than its predecessor, and when paired with the D3300 makes the camera package nearly 30% smaller and 25% lighter. An ideal 3X zoom lens for every on-the-go moment, the 18-55mm f/3.5-5.6G VR II lens features up to four stops3 of VR image stabilization, a silent wave motor to ensure quiet AF operation and auto/manual focusing options. 10-24mm to the super telephoto 800mm VR, Nikon photographers have come to rely upon the NIKKOR core technologies that contribute to their optical superiority. NIKKOR is the brand name for Nikon’s photographic lenses, which are precision crafted to the most exacting standards in Nikon’s own glassworks. In 1933, Nikon marketed its first camera lens under the NIKKOR brand name, the “Aero-NIKKOR” for aerial photography applications. Since then, NIKKOR has been used as a brand name for Nikon’s lenses that symbolizes durability, high image quality and optical excellence.